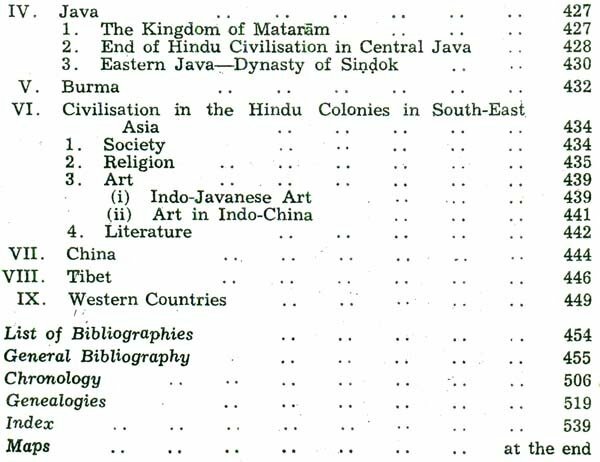 The Age of Imperial Kanauj, with which this Volume deals, deserves a more important place in Indian history than it has been given so' far. I should, therefore, be forgiven if I gave in my own way a picture as I see it. The Age begins with the repulse of the Arab invasions on the mainland of India in the beginning of the eighth century and ends with the fateful year A.D. 997 when Afghanistan passed into the hands of the Turks. With this Age, ancient India came to' an end. At the turn of its last century, Sabuktigin and Mahmud came to powerin Ghazni. Their lust, which found expression in the following decades, was to shake the very foundations' of life in India, releasing new forces. They gave birth to medieval India. Till the rise of the Hindu power in Maharashtra in the eighteenth century, India was to pass through a period of collective resistance. This Age of Imperial Kanauj, on the other hand, was an era 'of great strength and achievement for India. The Arabs who were on .a march in three continents were repulsed. Throughout they were held on the frontiers. The Tibetan power was eliminated from Nepal. The South emerged effectively in the political life of the country, as it had emerged in the earlier age in its religious and cultural life. 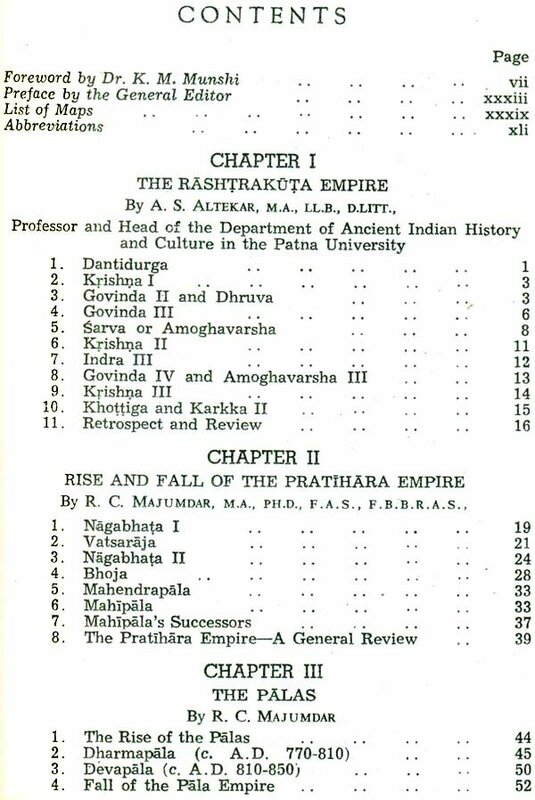 This Age saw the rise and fall of three great Empires in the country: of the Rashtrakiitas, founded by Dantidurga (c. A.D. 733757) and his successor, Krishna I (c. A.D. 757-773), which dominated the South till its collapse in the year A.D. 974; of the Palas in the East, 'which saw its zenith under Dharmapala (c. A.D. 770810) ,though it revived a little at the end of the tenth century; of the, Pratiharas of the West and North. founded by Nagabhata I, which saw its zenith during the reigns of Mihira Bhoja (c.A.D. 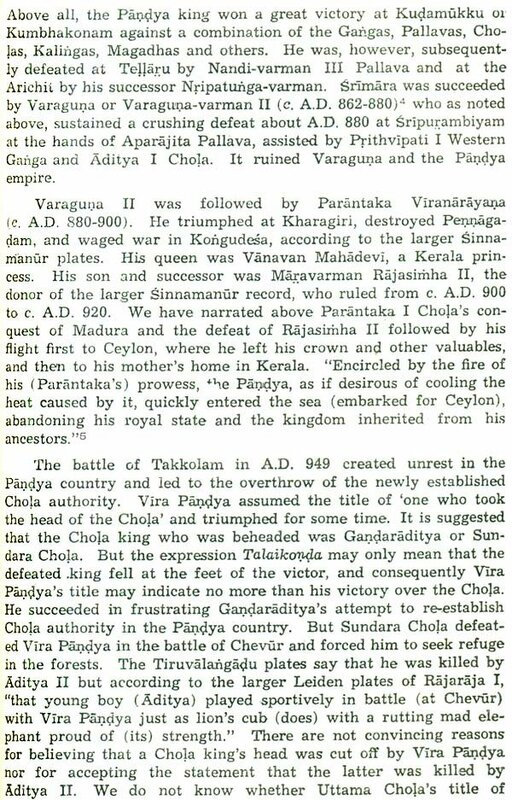 836-885) and Mahendrapala (c. A.D. 885-908), went under on account of the catastrophic blows dealt by the Rashtrakuta raids, but retained a shadowy imperial dignity to the end. By inheritance Kanauj was the home of Indo-Aryan traditions. 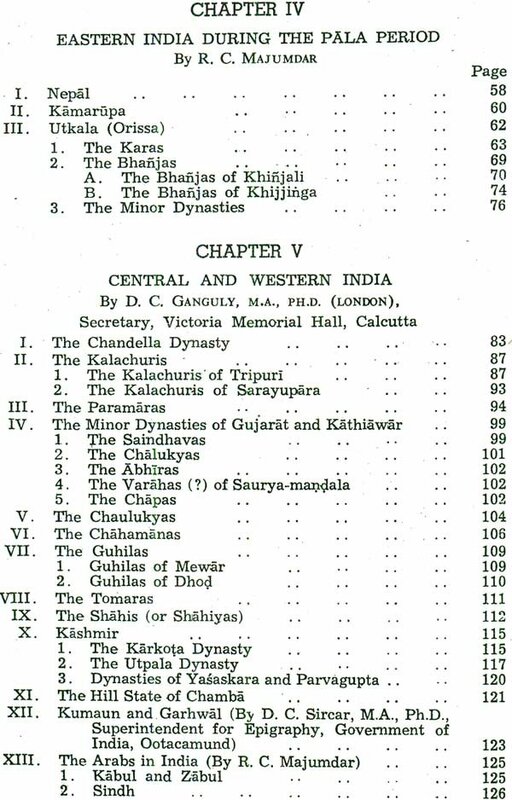 In the post-Vedic ages the region from Hardwar to Urmao, near Lucknow, was known as Aryavarta. Later with the spread of IndoAryan culture, first, north India, and then the whole country, came to be called by that name. 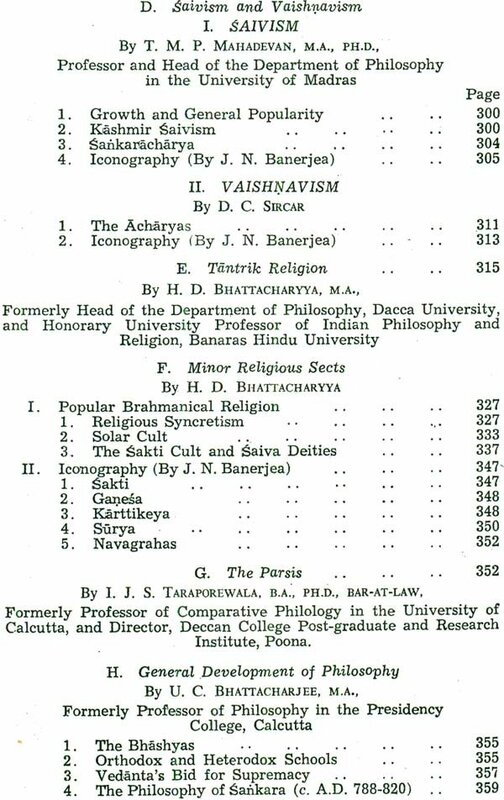 The original Aryavarta then come to be known as Brahmavarta, with accretions, was called Madhyadesa during this age. When Hastinapura met with disaster due to floods, as the recent excavations at Hastinapura corroborative of the Puranic testimony show, Nichakshu, the descendant of Janamejaya Parikshita led the Kurus to Kausambi. In the early sixth century when the Magadhan Age opened, it was the capital of a powerful Aryan kingdom; Vatsaraja, who could lure elephants by his music, was then its ruler. It remained such capital till the end of the sixth century of the Christian Era. Then North India was overrun by the Hunas Kausambi was destroyed. But with isanavarman, the liberator who drove out the Hunas, Kanauj came into prominence, as the centre of power in Madhyadesa, no longer a principality of the Gupta Empire. In the seventh century the kings of Bengal and Mlalava destroyed the power of Kanauj, then in the hands of the descendants of isanavarman. On ·the ruins of the Maukhari kingdom, Sri 'Harsha built his short-lived empire of Madhyadesa. During his forty-two years' rule (A.D. 606-647), Kanauj grew into the foremost city of India. Sri Harsha, however, could not create a hierarchy pledged to support his Imperial structure. He left no able successor. His empire was dissolved soon after he died. For more than half a· century thereafter, the history of Kanauj is wrapt in obscurity. At the end of. it, Yasovarman, a great conqueror and the patron of Bhavabhtrti and Vakpati, is found ruling Kanauj. Both Yasovarman and Lalitaditya of Kashmir joined hands against the inroads of the Arabs and Tibetans. But the allies soon fell out and Lalitaditya destroyed the power of Yasovarman. The classical age of India closed with the reign of Yasovarman This age then opened with one Indrayudha on the throne of Kanauj, which had retained its metropolitan and symbolic importance as the capital of India. And the stage was set for the triangular struggle for it between the Rashtrakiitas of the South, the Pratiharas of Gurjaradesa and the Palas of Bengal. The first great conqueror to emerge on the scene, with the Age, was the Rashtrakirta Dantidurga. The son of Indra I by a Chalukyan princess of Gujarat, he began his Napoleonic career in c. A.D. 733, became the master of the whole of Maharashtra by 753, and destroyed the Chalukyan Empire to assume an imperial status. He was succeeded by his uncle Krishna I, the builder of the Kailasa temple of Ellora. In a reign of fifteen years, he added to the empire what are the modern states of Hyderabad and Mysore. About the same time, Gopala, elected to the position of a chieftain, consolidated Bengal. His son Dharmapala (c. A.D. 770-810) led his conquering army through the whole valley of Ganga; reduced the ruler of Kanauj to a puppet; held courts at Kanauj and Pataliputra. For long he commanded the allegiance of most/of the kings of the north. There was ferment also in the west. In A.D. 712 the Arabs conquered Sindh. About A.D. 725 Junaid, its governor, under the orders of Caliph Hasham of Baghdad, sent an army for the conquest of India. It overran Saureshtra, Bhillamala, the capital of Gurjara (the Abu Region), and reached Ujjayini. Then arose an unknown hero, Nagabhata by name; possibly he belonged to a branch of the royal Pratihara family Of Bhillamala, the capital of Gurjaradesa. He rallied to his banner the warriors 'of the allied clans of Pratiharas, Chahamanas and also, perhaps, Guhilaputras, Chalukyas and Paramaras, all of whom had their home in the region of Mount Abu. Nagabhata fought the invading army, flung it back, destroyed it. This victory welded the clans of Gurjaradesa into a hierarchy. It gave them self-assurance and. the will to conquer. With a leader and a destiny, they laid the foundations of a new power that was destined to play an important part in history. During Nagabhata's time Dantidurga with his conquering army swept over the north, captured Ujjayini, where the Pratihara, his fortunes temporarily eclipsed, played the host to the conqueror. 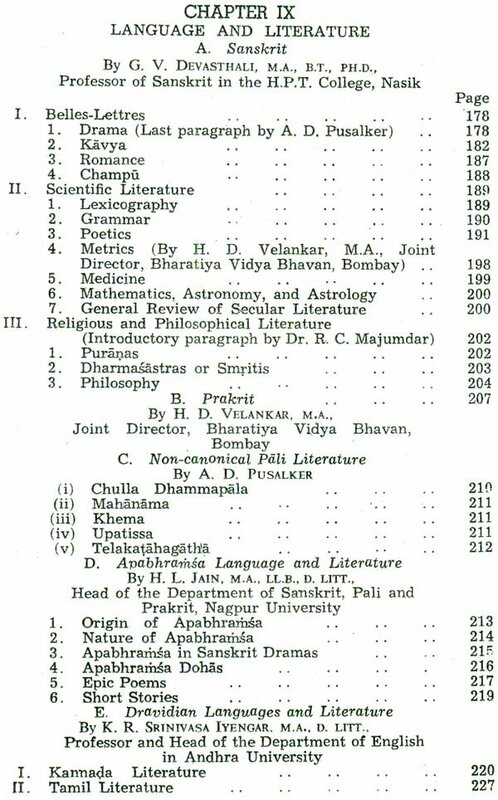 The preceding volume closed with an account of the shortlived empires in Northern India founded .by Harsha-vardhana, Yasovarman, .and Lalitaditya. But although they failed in their efforts to build up a stable empire, the imperial tradition handed down by them bore rich fruit during the period covered by this volume. 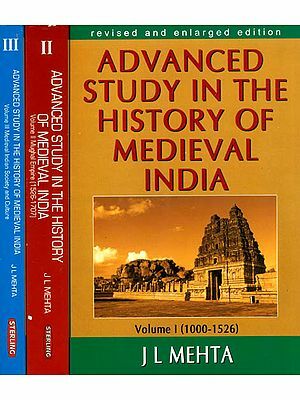 The middle of the eighth century A.D., which marks its commencement, is a great landmark in Indian history. It saw the rise of three great dynasties which were destined to play the imperial role. with far greater success than any of the' three individual heroes mentioned above. Of these three great dynasties the Gurjara-Pratiharas were the earliest, and the foundation of their power in Western India, shortly before A. D .750, has been described in the preceding volume. The two other powers, which suddenly came into prominence about the same time, were the Palas of Eastern .India and the Rashtrakutas of the Deccan. The rivalry and struggle between these three great powers forms the dominant theme of history dealt with in' this volume. The city of Kanauj was raised to the dignity of an imperial capital by Harsha-vardhana, But though his empire collapsed .with his death, the glamour: of Kanauj was revived by Yasovarman. During the period under review it formed the centre of attraction of all the three great powers, and they regarded its possession as a consummation to be devoutly wished for. It was finally chosen as the capital by the Gurjara-Pratiharas. Under them it rose to be the finest city in the whole of India and continued' as such till the end of the period covered by this volume. This circumstance has suggested the name of this volume, viz. 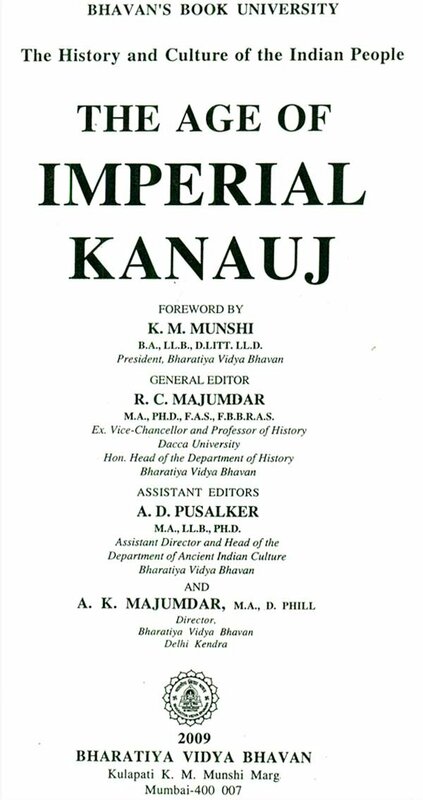 The Age of Imperial Kanauj. 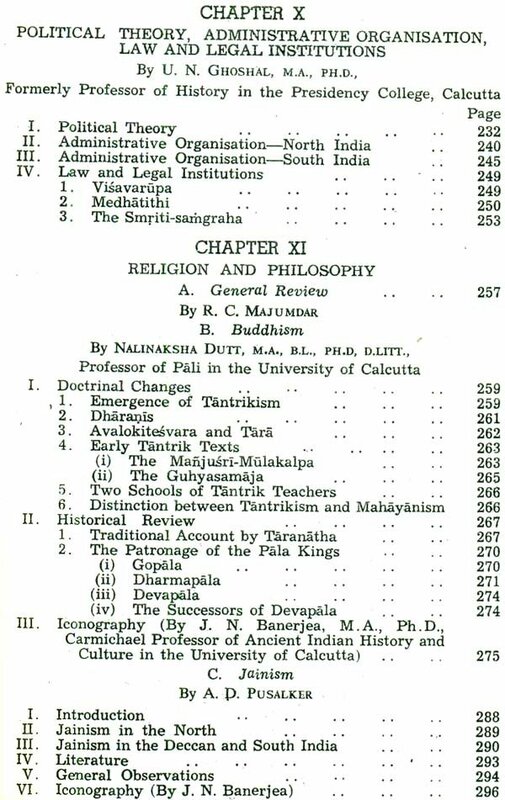 It is hardly necessary to add that this nomenclature is only to be taken in a general sense, and Ts not intended to cover the entire history dealt with 'in this volume. Indeed no title could be devised' which fulfils this condition, and no apology is perhaps needed' to name any particular volume after its dominant theme. The period, covered by this volume witnessed the rise and fall of three empires. The Palas under Dharmapala and Devapala established a mighty empire, and they claimed allegiance of nearly the whole of Northern India. Then came the turn of the Pratiharas who, under Bhoja and Mahendrapala, brought under their direct administration a vast extent of territory, from the Kathiawad Peninsula in the west to Northern Bengal in the east. No such empire flourished in North India after the Guptas. For there is no doubt that the Gurjara-Pratihara Empire was more extensive, more durable, and had a more stable and organised administration than the empire of Harsha-vardhana. 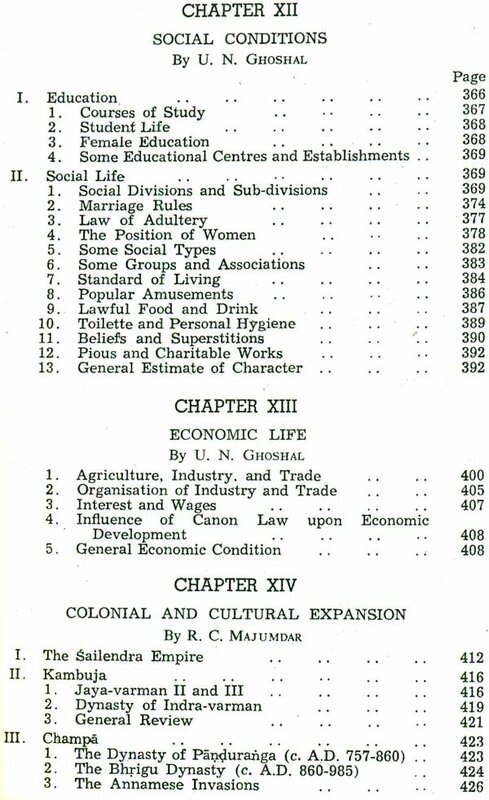 The detailed account of this empire in the present volume will show the erroneous, almost ludicrous, character of the 'notion that Harsha-vardhana was the last empire builder In Northern India, to which reference has been made in the Preface to the preceding volume. Both the Palas and Pratiharas felt the full brunt of the Rashtrakuta power. Although the Rashtrakutas ruled over the Deccan, they were fired by the ambition of conquering Northern India. They defeated the Pratihara rulers Vatsaraja and Nagabhata and the Pala king Dharmapala. Under Dhruva and his son Govinda III they proved to be the greatest military power in India, and while the former carried his victorious campaign as far as, the do and between the Ganga and the Yamuna, the latter overran the whole country up to the Himalayas. Even a century later, one of their' successors sacked the imperial city of Kanauj, then at the heyday of its glory, and forced the Pratihara Emperor to fly for his life. The Rashtrakutas also successfully fought with the Pallavas and other powers of the South Indian Peninsula, and advanced even as far as Ramesvaram. From the political point of view the Rashtrakuta Empire constitutes the most brilliant episode in the history of the ancient Deccan. No other power, south of the Vindhyas, played such a dominant role in the history of North India, until the age of the Maratha Peshwas in the eighteenth century. The Pratiharas, though never a match for the Rashtrakutas, played a dominant role in North Indian politics. They stood as bulwark against the Muslims of the Sindhu valley. It has been asserted by the Muslim writers that the Pratiharas were the greatest foes of the Muslims, and could easily defeat the latter; but whenever the Pratiharas advanced, the Muslims threatened to destroy: the famous image of the Sun-god in Multan, and the Pratiharas immediately retreated. 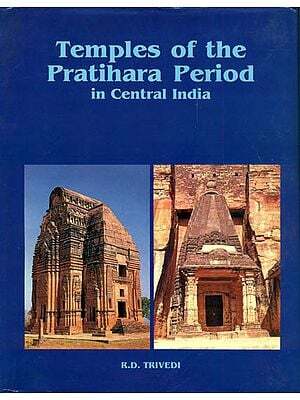 The Muslims thus took advantage of the religious feelings of the Hindu Pratiharas in order to save themselves from, impending ruin. 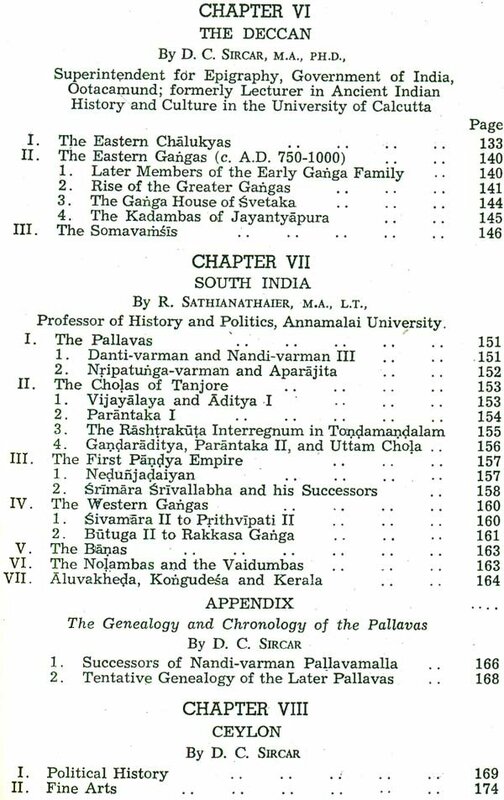 The Kanyakubja Gauda Struggle – From the 6th to the 12th Century A.D.